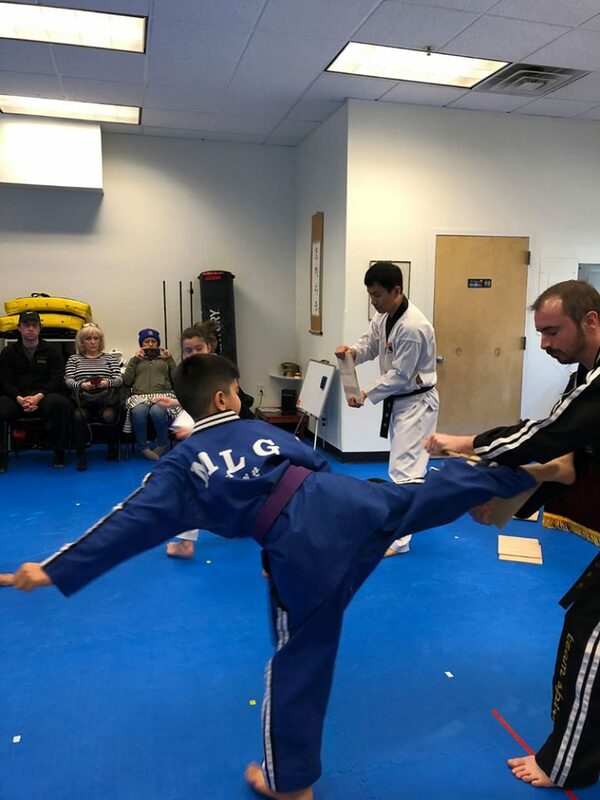 On March 17th, 2019 qualifying students gathered at Hong Ik Martial Arts of Mahwah to test for their next belt level. 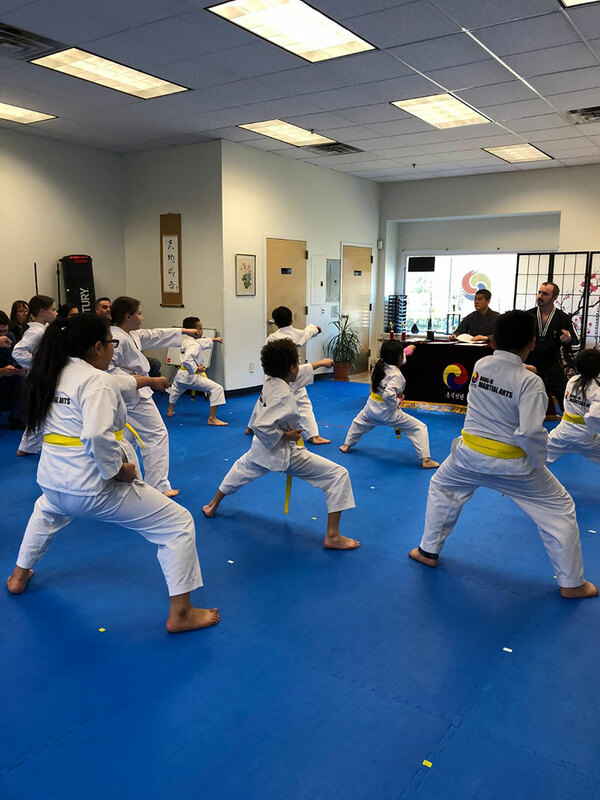 Testing is often an opportunity not only to pass to the next level, but to learn from the experience and “grow their soul” as Grand Master Yoo teaches. Before each exam Grand Master Yoo speaks to the students to help prepare them for the test, and give perspective to understand the importance of their hard work. Grand Master Yoo began his lesson by explaining that our bodies are like tools. If you would like to hang a clock on the wall, you need a hammer, and nail to hang it, these are tools. Our bodies are similar to tools in that they are functional to do material tasks. Our brains however are more important than the tools because our brains are in charge of thinking. He goes back to the example about the clock, “If Master Joe wants to hang the clock, he needs to think about a good place to put it. This is a job of the brain”. The students begin to understand his idea and are interested to find out where it is going. “There is something between the brain and body that we always feel, from the day we are born until the day we die, does anyone know what that is?” “Energy!” one student shouts. Grand Master Yoo explains that when the student says “energy” it is as if we already knew the answer, and that is called “truth”. He goes on to explain that energy is always changing like nature, in the spring flowers grow, in the summer the leaves expand, in the fall the leaves fall off, and in the winter water accumulates underground to feed to the trees when the spring comes, this is the cycle of nature. “Did you bring your soul today?”. Students and parents all listened intently as he explains “the soul is the manager of your energy, the soul takes care of your energy. Sometimes it makes you feel very miserable, and sometimes it makes you feel very happy depending on the management of your energy by your soul. There is something beyond your emotions, and energy, you can’t see it, but you can feel it. If your soul is managing your emotions very well, then your life becomes emotionally rich with happiness and peace. So how do we manage our energy? Would you like to make your soul happier?” Grand Master Yoo asks. “Yes sir!” the students reply. Grand Master Yoo goes on to explain that you can change your energy from sad to happy, lazy to active, nervous to brave and if you do change your energy, you can make your life happier. If you are able to make your life happier, the next step is to help others to be happier like you. That is the job of a leader. Those who want to make themselves happy and other’s happy too are living a cosmic life. Grand Master Yoo explains “Cosmic life doesn’t mean flying into outer space and living in a space craft, that is a dangerous life. Cosmic life means to live like nature.” He gives the example of a tree. When a tree blooms its flowers in the spring, everyone can smell them. When a tree produces apples, everyone can eat them, the tree doesnt treat any person differently. If we apply that to ourselves, and try to give out help and energy to people that is called Hong Ik In Gan which transtates to “service for the benefit of humanity”. 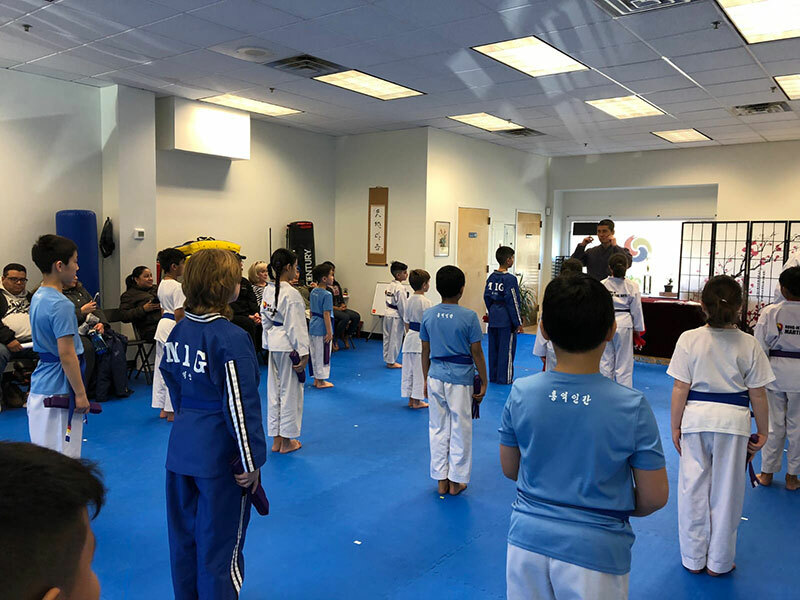 The students, having understood Grand Master Yoo’s lesson, now had a choice to change their energy from nervous to brave and try their best to grow their soul. The test went very well. All students passed to the next level, and hopefully had an experience that will last with them for their lifetime.